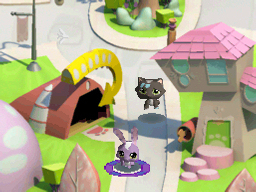 Littlest Pet Shop Friends is the newest set of titles in the popular line of toy to video game adaptations. As with the first run of games, there are a few options to choose from, in the form of Country, City and Beach versions. 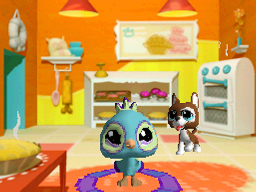 In a move previously established by the franchise, each game allows users to adopt a set number of like Littlest Pets, and then fills in the rest of the game's catalog with pets unique to each version. The gameplay here retains little from its previous installments, which is apparent first and foremost in the inclusion of a true, albeit very uninteresting storyline. A bear and a caterpillar are best friends. The bear moves into the country, where he meets some dogs, birds, beavers, horses, and other critters. All of the pets wish to welcome the bear and the caterpillar to the neighborhood by throwing a surprise party, including decorations, food, and other assorted goodies that you must help the animals find and/or create. 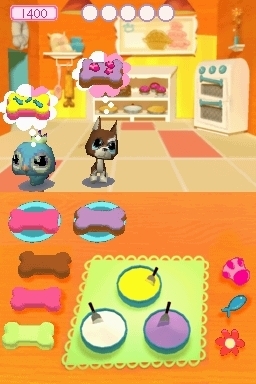 Where the first installments in the Littlest Pet Shop franchise contained loads of player freedom in terms of how the game progressed (albeit at the sacrifice of a true storyline), Littlest Pet Shop Friends: Country does a complete 180 - creating a step-by-step, linear, and downright boring gameplay experience. Regardless of the fact that the game is meant for a younger audience, things have been made so simplistic here that it seems impossible for anyone even in the tween age group to find enjoyment in the setup. The game literally tells you where to go, what buttons to press and in what order, what items to buy and when - ignore these lessons and the game stops, the story never progressing, leaving you twiddling your thumbs until you decide to follow the rules. 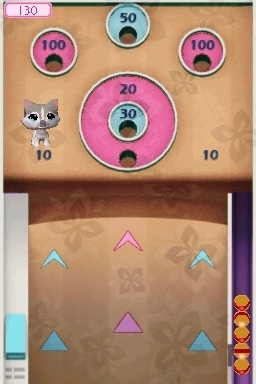 Unfortunately, following the set path is the only way you'll unlock new outfits and accessories for your pets (you are now allowed to change their colors), along with new mini-games, with both being arguably the biggest draws of the game in the first place - all hidden within a shoddy story that only requires your interaction with them at set intervals. "We need to get some ice cream for the party - earn a high score on this mini-game and we can get some!" Speaking of mini-games, the previous titles contained creative and even addictive titles offering real challenge (on the higher difficulty levels) even in the scope of adult or otherwise highly skilled players. Here, most every game is a take on one of two very basic templates: either catch items as they fall from the top screen to the bottom, or throw items from the touch screen to the top. 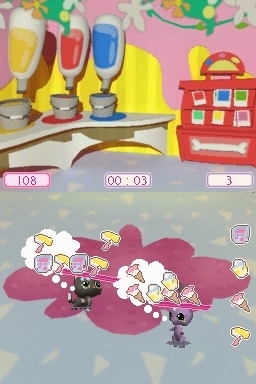 As specific examples, one game has you collecting falling scoops of ice cream on moveable cones, while another has you catching falling toys in like buckets. 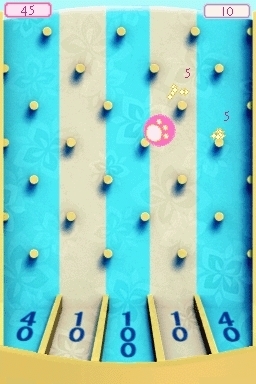 On the other side of the token, you have a shuffleboard inspired mini-game that asks you to slide the appropriate candy to the top screen, landing as close to the center of a target as possible, along with a standard take on Skee-ball. The only positive that comes from this is that once you've mastered one game, by extension, you've mastered a large chunk of them, and can rack up Kibble, the game's currency like mad, allowing you to purchase fancier versions of items during the mandatory shopping sequences. However, when taken as a whole experience, the mini-games and storyline are forgettable, and the only remarkable thing about the entire title is the fact that the pets now talk. In terms of sequels, Littlest Pet Shop Friends: Country is a huge step backwards. 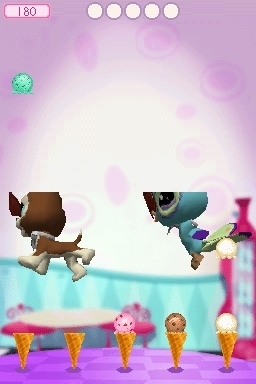 Everything fun and appreciated from the first run of Littlest Pet Shop titles, including the adorable graphics, has been replaced by something uninspired (in the graphical example, things are much paler, grainier, and more glitchy - think "stuck behind objects, invisible wall" glitchy). Perhaps the game's flaws are so apparent because of the difference between my age and that of the target audience, but even so, the game's storyline is so trivial that all manner of gamer, regardless of age, would most likely quickly become uninterested. The first Littlest Pet Shop DS titles were particularly noteworthy in the realm of oft-repeated children's offerings, but Country simply fails to impress in the same way. If you have a Littlest Pet Shop fan in the family, stick with one of the original titles, or prepare to deal with their inevitable disappointment. Special thanks to Lilit Baron and EA for providing a copy of this title.